These adorable Crochet Hair Bows are so easy to make that you can easily have one in all your favorite colors in a little under an hour. 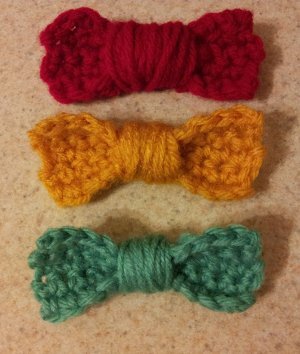 Great for beginners and advanced crocheters alike, these cute bows are great for dressing up your hair do. Attach them to hair clips or create a simple headband to show off your new bow! If you are looking for a great way to use up your stash, these little bows are a great way to create something you will actually use. These crochet bows look fabulous in any color, making them crazy customizable and perfect for using your stash in a brand new and interesting way. These would be perfect for your baby hat patterns. Find this project and more in our free eBook, How to Make Bows, Hair Pins and More: 33 DIY Hair Accessories. For a smaller bow, chain 11. For a larger bow, chain 16. Single crochet in second stitch from hook, and in each stitch following until the end (10, 15 single crochets). Turn. Chain 1, single crochet in second stitch from hook and in each stitch following. Turn. Repeat step three 4 more times, or more if you want a larger bow. 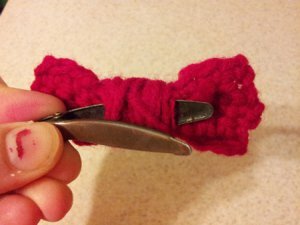 To assemble, fold bow in half hot dog wise and wrap yarn around the middle of the bow. Tie off to secure. If you want to wear the bow in your hair, just wiggle a hair clip through the back of the wrapped part of the bow. I don’t glue mine to the barrette, but you can if you want. I like to switch out my bows to match my outfit, and using a strong barrette like this works great for my thick hair. 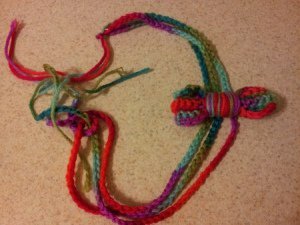 If you want to make a headband, create three chains of 70 stitches each, or larger to fit your head. Simply sew the bow in place and you’re ready to go! If you are brand new to crochet, check out our collection of beginner crochet projects. There's no better way to learn how to crochet than exploring new patterns and learning along the way. 50+ Free Easy Crochet Patterns + Help for Beginners is the go-to spot for crochet newbies. i think that this is a great idea and they should do more as they go on through out there lives because its a gift out of doing really creative crafts and loving what you are doing !! !